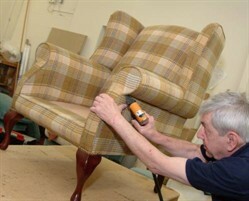 Our highly skilled in house upholstery specialists are amongst the best in the business. Having served their apprenticeships with the leading furniture manufacturers they are able to offer our customers the highest standards of workmanship. From a footstool, to a 3 piece suite to an antique french bed we provide professional high class re-upholstery. When placed in such skilled hands even the most tired piece of furniture can be transformed and could provide the finishing touch to your room. We are also able to offer complete flame proofing solutions for all the fabrics we supply bringing them fully up to British Standard requirements.